Many climate studies assess trends and projections in heavy precipitation events using precipitation percentile (or quantile) indices. Here we investigate three different percentile indices that are commonly used. We demonstrate that these may produce very different results and thus require great care with interpretation. More specifically, consideration is given to two intensity-based indices and one frequency-based index, namely (a) all-day percentiles, (b) wet-day percentiles, and (c) frequency indices based on the exceedance of a percentile threshold. Wet-day percentiles are conditionally computed for the subset of wet events (with precipitation exceeding some threshold, e.g. 1 mm/d for daily precipitation). We present evidence that this commonly used methodology can lead to artifacts and misleading results if significant changes in the wet-day frequency are not accounted for. Percentile threshold indices measure the frequency of exceedance with respect to a percentile-based threshold. We show that these indices yield an assessment of changes in heavy precipitation events that is qualitatively consistent with all-day percentiles, but there are substantial differences in quantitative terms. We discuss the reasons for these effects, present a theoretical assessment, and provide a series of examples using global and regional climate models to quantify the effects in typical applications. Application to climate model output shows that these considerations are relevant to a wide range of typical climate-change applications. In particular, wet-day percentiles generally yield different results, and in most instances should not be used for the impact-oriented assessment of changes in heavy precipitation events. There is increasing evidence that anthropogenic climate change leads to an intensification of the water cycle and attendant effects on heavy and extreme precipitation events. The 5th assessment report of the IPCC (2013) concludes that the frequency and intensity of heavy precipitation events have likely increased in a number of areas, among these North America and Europe, and it projects that heavy precipitation events over most of the mid-latitude land masses and over wet tropical regions will become more intense and frequent by the end of this century. These changes are important for a number of potential impacts, including floods, erosion, water resources, agriculture and ecosystems. Past studies have used a number of statistical methodologies to assess changes in heavy precipitation events in long-term observational rain gauge series and climate simulations. Some of the early studies in this area (e.g. Noda and Tokioka 1989; Gordon et al. 1992; Fowler and Hennessy 1995) typically defined 5 to 8 intensity classes, and addressed changes in each of these. As the classes are subjectively selected, the choice may suit a certain region but miss the heavy events of another, due to tremendous geographical variations. Subsequent studies have thus attempted to make the analyses more versatile with respect to the wide range of climates that need to be considered. Simple indices that have been considered include the average yearly or seasonal maximum 1-day precipitation amount (e.g. Räisänen and Joelsson 2001), or exceedance counts with respect to carefully selected thresholds. More sophisticated methodologies include statistical analysis using a gamma distribution (e.g. Gregory and Mitchell 1995; Groisman et al. 1999; Voss et al. 2002; Zolina et al. 2009), or the application of extreme value theory (EVT, e.g. Zwiers and Kharin 1998; Frei et al. 2006; Fowler et al. 2007). Many of these studies employ a mixed statistical model (for instance a binary distribution for precipitation occurrence, and a gamma distribution for precipitation amounts). Such methodologies have successfully been applied in a number of studies and are particularly common in water resource engineering applications. In this study we are concerned with percentile indices. These indices are used to address moderate to heavy precipitation events, i.e. precipitation events that are larger than average events (that may be assessed by their mean daily intensity), but smaller than rare extremes (that require more sophisticated statistical approaches). They are popular because they combine simplicity with flexibility. In particular, one single percentile index is able to assess changes in heavy events in vastly different climatic conditions (e.g. Suppiah and Hennessy 1998). Percentile indices are also used to assess process-based interpretations of precipitation events with the Clausius-Clapeyron relationship (e.g. Frei et al. 1998; Allen and Ingram 2002; Ban et al. 2015), and in statistical downscaling and bias correction methodologies (Maraun et al. 2010). All-day percentiles (e.g. Moberg et al. 2006; O’Gorman and Schneider 2009; O’Gorman 2014; Ban et al. 2015): In this case the percentiles are expressed relative to all data, i.e. wet and dry days or hours. Changes in all-day percentile indices are directly related to changes in heavy events with a given absolute frequency (or return period), and may be viewed as an empirical alternative to EVT in the case of moderate extremes. Wet-day percentiles (e.g. Boroneant et al. 2006; Frei et al. 2006; Lenderink and van Meijgaard 2008; Rajczak et al. 2013; Kendon et al. 2014). In this case precipitation percentiles are computed for the subset of days or hours with non-zero precipitation, i.e. with precipitation above daily or hourly thresholds of typically 1 mm/d or 0.1 mm/h, respectively. These thresholds have been motivated from observational constraints. Frequency indices based on percentile thresholds (e.g. Karl and Knight 1998; Frei and Schär 2001; Durman et al. 2001; Klein Tank and Können 2003; Orlowsky and Seneviratne 2012; Sillmann et al. 2013; Giorgi et al. 2014): In this case, percentile thresholds are derived for some reference period, and the subsequent analysis then targets the frequency with which these thresholds are exceeded. This procedure corresponds to the official recommendation of the World Climate Research Program (WCRP) and the World Meteorological Organization (WMO 2009; Zhang et al. 2011). The methodology does not fully classify as a percentile methodology; it rather corresponds to a frequency methodology, but using a percentile-based definition of the thresholds. Many studies have used a combination of percentile indices. For instance, Karl and Knight (1998) used both frequency and intensity-based indices and found that the observed precipitation increase of about 10 % across the contiguous United States is primarily due to increases in heavy and extreme daily precipitation events. Other studies used wet-day percentiles in the analysis of precipitation scaling, but all-day percentiles when assessing climate change simulations, because “it is the absolute frequency of occurrence of extremes that counts for society” (Lenderink and van Meijgaard 2008). There are also a number of studies that do not explicitly specify the type of percentiles used. Here we will present a theoretical analysis and an intercomparison of percentile indices using typical climate change applications. It will be shown that in general the three types of indices yield different results. In particular, we show that changes in the frequency of wet days (or wet hours) may potentially lead to misleading results when addressing changes in heavy precipitation events using wet-day percentile indices. Difficulties with wet-day percentiles have previously been noted. In particular, Hennessy et al. (1999) pointed out that changes in observational precipitation thresholds associated with switching from imperial to metric units introduced apparent trends in the number of raindays. Shortly thereafter, Haylock and Nicholls (2000) provided a thorough discussion of the role of the wet-day thresholds and concluded that percentile indices can be sensitive to changes in the number of raindays. However, the sensitivity revealed did not appear alarming, as observational precipitation series with comparatively small trends in wet-day frequency were used. In the climate change context, however, it is evident that changes in wet-day frequency are substantial (e.g. Rajczak et al. 2013) and may dominate changes in precipitation totals over much of the subtropics (Polade et al. 2014). Some previous work has also addressed challenges with yet another percentile index, namely the fraction of precipitation that falls above the 95th wet-day percentile (commonly referred to as the R95pTOT index). In particular Zolina et al. (2009) and Leander et al. (2014) have investigated the statistical properties of this index, and have proposed alternate versions thereof. In the current paper we will restrict attention to the basic form of the percentile indices. The outline of the paper is as follows: Section 2 provides an overview of the three precipitation percentile indices and investigates potential artifacts in a conceptual and theoretical framework. Section 3 provides examples and an intercomparison of different percentile indices using output from a number of GCM and RCM experiments. Section 4 concludes the study. For most of the paper (except for section 3.3), consideration is given to the statistics of daily events, but the concepts can also be applied to shorter accumulation periods, such as hourly data. Precipitation percentile indices are generally computed from long series of precipitation data. To compute the percentiles, the data is sorted in ascending order, and the resulting distribution can be interpreted as a representation of the frequency-intensity relation of precipitation. In this section we discuss the three categories of percentile indices using daily precipitation accumulations to define events and indices. The indices are discussed along Fig. 1a–c, respectively, where precipitation percentiles P [mm/d] are shown as a function of cumulative probability g. We will use the inverse cumulative distribution function P(g), where g is a probability variable ranging from 0 to 1. In a statistical sense, daily precipitation is expected to exceed P(g) with an absolute frequency of F = 1–g, and to fall below P(g) with a probability of g.
For illustration, Fig. 1 assumes two precipitation distributions (shown in blue and red) representing hypothetical current and future climatic conditions, respectively. For simplicity we consider a change where the event size (intensity P) decreases throughout the event spectrum from current to future conditions. The two distributions are assumed to have a similar incidence of heavy events, but significantly different precipitation frequencies (defined as days with precipitation exceeding a threshold of 1 mm/d). For display purposes, comparatively low percentiles are selected (i.e. 80 % in Fig. 1a), but this choice does not affect the argument. In the case of all-day percentiles, all (wet and dry) events are included in the statistics (see Fig. 1a). All-day percentile indices thus represent the intensity of some n largest events per season/year, and they correspond to events with an absolute frequency or return period. Changes in all-day percentiles may be expressed as δP(g)=P’(g)–P(g), where P(g) and P’(g) denote the distributions for the current and future conditions, respectively. In the case of wet-day percentiles (Fig. 1b), days with precipitation below some threshold (here 1 mm/d) are considered as dry, and the percentiles are computed for the fraction of wet days. Changes in wet-day percentiles are affected by changes in both the occurrence of heavy events and the number of wet days. If there are substantial changes in wet-day fraction, the procedure may yield misleading results. For example, consider the wet-day 60th percentiles for current and future conditions in Fig. 1b (represented by blue and red bullets, respectively). There is an increase in this percentile, which may be mistaken as an increase in heavy events – yet there is an evident decrease in intensity throughout the event spectrum (blue and red curves). This potentially misleading result is due to the use of a precipitation threshold in combination with significant changes in wet-day fraction. Figure 1a and b underline the key point of this paper, namely that the interpretation of changes in wet-day percentiles is strongly sensitive to changes in wet-day fraction: This seemingly counter-intuitive sensitivity comes about because, in statistical parlance, wet-day percentiles are conditional upon the occurrence of a wet day. In our example, a reduction in wet-day frequency implies that the wet-day precipitation distribution is compressed across fewer events, and thus there is an increase in intensity conditional on the occurrence of a wet day, even though heavy events decrease. As a result, changes in wet-day percentiles implicitly compare intensities taken at different absolute probabilities. This contrasts with all-day percentiles (Fig. 1a), which are free of this complication. The consideration of wet-day percentiles may, however, be useful to gain insight into changes of the precipitation intensity process in isolation from changes in the occurrence process. More specifically, one may argue that the frequency of precipitation events is determined by the sequence of synoptic-scale circulation patterns, while the event intensity is governed by underlying precipitation processes (see Fowler and Hennessy 1995; Frei et al. 2006; Lenderink and van Meijgaard 2008; Chan et al. 2015). However, if such arguments are applied to impact-relevant considerations, then the conditional nature of wet-day percentiles needs to be accounted for. This applies for instance to the assessment of precipitation scaling (e.g. in relation to the Clausius-Clapeyron effect) when addressing projections of heavy events (Ban et al. 2015). The relationship between changes in all-day and wet-day percentiles can be assessed analytically. To do so we consider the all-day cumulative precipitation distribution P(g), and the corresponding wet-day cumulative precipitation distribution function P w (g w ). The probability variable g measures probabilities relative to all days, while g w does so relative to wet days (see Fig. 1b). A detailed mathematical analysis using a linearization is presented in the Appendix. To simplify the argument, we here assume that current and future precipitation distributions are identical at intermediate to high percentiles, but different at low percentiles and in terms of wet-day frequency f w . This is qualitatively similar to the situation shown in Fig. 1 (see blue and red curves), but more pronounced, as the two distributions are assumed to be identical at high percentiles, i.e. δP = 0. To simplify the analysis we also assume that precipitation follows an exponential distribution locally, that is, near the intensity considered. The frequency F of events exceeding intensity P is assumed to decrease proportionally to e − P/β , where β > 0 is a scale parameter (see Appendix A1 for further details). where δf w /f w and δP w /P w denote relative changes in wet-day frequency and wet-day percentiles, respectively. This is a remarkably simple result, stating that even in absence of changes in all-day percentiles (i.e. δP = 0), there may be changes in wet-day percentiles. These are equal to minus the product of the relative changes in wet-day frequency δf w /f w and the normalized scale parameter β/P. It should be noted that in order to consider events of the same frequency (or return period), some adjustment may be needed when objectively comparing wet-day against all-day percentiles. For instance, in the example considered in Fig. 1, the 80th all-day percentile and the 60th wet-day percentiles correspond to roughly the same event frequency (see Appendix A3 for details). To finalize the analysis we next consider indices that assess the frequency of exceedance with respect to a precipitation threshold. Many studies define precipitation thresholds using percentiles; such indices are commonly referred to as percentile indices (e.g. WMO 2009), but they represent frequency indices. Figure 1c illustrates the analysis. In the example shown the precipitation threshold P t is defined as the 80th all-day percentile, but the subsequent discussion is valid irrespective of how the threshold is defined, provided the threshold is kept fixed throughout the analysis (i.e. the same absolute threshold is used in both the control and scenario periods; see Zhang et al. 2011, for details on the threshold calculation). In contrast to the full percentile methodology (subsection 2.1) the procedure measures changes in threshold exceedance frequency F, rather than changes in event size P (compare red/blue bullets in Fig. 1c against 1a). For this reason, the methodology does not fully classify as a percentile methodology; it rather corresponds to a frequency methodology, but using a percentile-based definition of the thresholds. Here β’ is the scale parameter of the scenario distribution P’(g). Equation (2) shows, consistent with Fig. 1a and c, that increases in all-day percentiles at a given probability level go along with increases in frequency at the respective percentile threshold, and vice versa. Thus frequency indices yield similar information as all-day percentiles, but are quantitatively different. It is important to note that the above considerations are valid irrespective of how the thresholds are determined. In particular, they also apply to other types of frequency indices. In quantitative terms, (2) can be used to approximately convert between the indices. This requires estimating the factor β’/P from the precipitation distribution. For instance, using 10 years of precipitation data for Zurich, we find that β/P has values between approximately 0.2 and 0.5 for daily precipitation between the 70th and 98th percentile. Thus, relative changes in frequency will be larger than relative changes in percentiles. To investigate the quantitative role of different percentile index definitions, we proceed by giving consideration to end-of-century precipitation projections from global and regional climate model simulations. In all figures presented, panels (a–c) will refer to the three indices considered in Fig. 1a–c, respectively. We begin with an analysis of daily precipitation events from the CMIP5 model experiments (Taylor et al. 2012). Following Fischer et al. (2014) we present ensemble-mean results based on 20 CMIP5 model simulations. Figure 2d depicts the wet-day fraction in the control period. Anthropogenic forcing causes substantial changes in wet-day fraction over large areas (Fig. 2e). The wet-day frequency increases in the tropics and high latitudes, and decreases in the subtropics and some of the extratropics (cf. Polade et al. 2014). These projected changes have appreciable magnitude. For instance, relative changes in wet-day fraction exceed +30 % in the equatorial Pacific and –30 % in Southern Europe and the Mediterranean. Figure 2a and b show projected changes in all-day and wet-day percentiles of daily precipitation. The two percentile analyses show pronounced differences. For example: changes in wet-day percentiles (Fig. 2b) signal significant increases in heavy precipitation events in Southern Europe, while all-day percentiles signal substantial decreases (Fig. 2a). This discrepancy is due to the conditional nature of wet-day percentiles, which may produce artifacts in areas with decreasing wet-day fraction. Qualitatively similar discrepancies are also evident for South Africa and Australia. The opposite effect can be observed at high latitudes. Here there are substantial increases in wet-day fraction (cf. Fig. 2e), and wet-day percentiles significantly underestimate the increases in heavy events (compare Fig. 2a and b). It should be stressed that Fig. 2a and b are not directly comparable, as they address different event levels (as determined by the selected percentiles of the all-day and wet-day distributions). In order to improve the comparison for events of similar probability (or return period), consideration was given to different percentiles. More specifically, Fig. 2a and b show the 97.5th and the 95th percentiles, respectively, which yields a perfect comparison for all locations where the wet-day frequency is 50 % (see Appendix A3). Figure 2c presents relative changes in threshold exceedance frequency. Here the threshold is determined as the 97.5th all-day percentile. Changes in this index exhibit the same pattern as all-day percentiles (Fig. 2a), but the amplitude of the changes is much larger (note different scale). These differences are consistent with the theoretical analysis in Section 2.3. The differences arise from the fact that Fig. 2a represents an intensity index, while Fig. 2c represents a frequency index (i.e. the index is determined as the exceedance frequency with respect to a threshold). Following Rajczak et al. (2013), consideration is given to a subset of 10 RCM simulations of the ENSEMBLES project (van der Linden and Mitchell 2009). Figure 3a–c shows projections using the same indices as in Fig. 2a–c. In addition, Fig. 3d–e show relative changes of 20-year return values (based on Rajczak et al. 2013), and in terms of the Rx1d index (which is computed as the mean of the 30 seasonal maxima of daily precipitation). The relative change in wet-day frequency is shown in Fig. 3f. The comparison of all-day and wet-day percentiles in Fig. 3a–b confirms the discrepancies expected from the previous discussion. While all-day percentiles (Fig. 3a) exhibit significant decreases in the incidence of heavy precipitation events throughout southern Europe, wet-day percentiles (Fig. 3b) project slight increases. This potentially misleading result is due to the projected decrease in the fraction of wet days (Fig. 3f), which exceeds 30 % in Southern Europe. In contrast, the pattern and amplitude of the changes in all-day percentiles (Fig. 3a) is fairly consistent with the changes in return levels and Rx1d index (see Fig. 3d–e). Some differences exist over France, England and Southeast Europe, where there is a sign change from moderate (97.5th all-day percentile) to heavy extremes (20-year return period). However, overall a coherent picture emerges: all-day percentiles (at sufficiently high level) are consistent with EVT, while wet-day percentiles yield different results. Comparison of the percentile threshold indices (Fig. 3c) against all-day percentiles (Fig. 3a) reveals similar characteristics as previously seen in Fig. 2. In particular the two indices exhibit the same pattern but different amplitudes. Further analysis shows that the differences in amplitude depend significantly upon the region; they are largest in Scandinavia and over the British Isles, but small over the Mediterranean. This can be explained by differences in precipitation statistics in the different regions, as expressed by the factor β’/P in (2). We finish the discussion with an intercomparison of percentile indices in very high-resolution climate change projections. The simulations cover an extended Alpine area from Northern Italy to Northern Germany at a grid spacing of 2.2 km and are 10 years long (Ban et al. 2014). Climate change projections using this approach are presented in Ban et al. (2015); the inconsistencies between all-day and wet-day percentiles actually surfaced when preparing that paper. As the modeling approach is able to explicitly resolve deep convective precipitation, consideration can be given to both daily (Fig. 4, top panels) and hourly accumulations (bottom panels). When computing wet-day and wet-hour percentiles, thresholds of 1 mm/day and 0.1 mm/h, respectively, are used to define the occurrence of precipitation. The two left-hand columns show a comparison of all-day/hour versus wet-day/hour percentile changes. The comparison reveals pronounced discrepancies for both daily and hourly events. For daily events, all-day percentiles signal an area-mean decrease of 10 % (see numbers in the upper-left corners of the panels), but wet-day percentiles a 12 % increase. For hourly events the discrepancies are even larger: all-hour percentiles signal a decrease of 14 %, but wet-hour percentiles a strong 28 % increase. The larger discrepancies in terms of hourly events are due to the larger relative decrease of the wet-hour fraction (in comparison to the decrease in wet-day fraction). The analysis demonstrates that changes in wet-day and wet-hour percentile indices may be strongly misleading. The comparison of all-day percentiles (column 1) against frequency indices (column 3) is also of interest. Consistent with Section 2.3, the two indices yield the same spatial patterns, but with substantially different amplitudes. The analysis thus confirms that both all-day percentiles and frequency indices yield valid and consistent information about changes in heavy precipitation events, while there are quantitative differences between the two indices. Note that in the case of the hourly analysis we have compared the 99.25th all-hour percentile against the 95th wet-hour percentile. This choice is based on the wet-hour frequency, which on average is substantially smaller than the wet-day frequency (8 % in comparison to 29 % in domain mean, higher over the Alps). Thus for comparing hourly indices, Eq. (A14) should not be used, but rather consideration should be given to using (A1) with a characteristic value of the wet-hour frequency. We have investigated three precipitation percentile indices that are commonly used in order to assess trends and projections of heavy precipitation events. Results show that wet-day percentiles (which are expressed relative to the fraction of wet events) are very sensitive to changes in the fraction of wet days/hours, and may produce misleading results when used to address changes in heavy precipitation events. The analysis of climate model output in section 3 demonstrates that this is critically important in typical climate change applications (for instance, an increase in wet-day percentiles does not necessarily reflect an increase in event intensity). More generally, statements that are conditional upon the occurrence of wet days/hours (which may itself be changing), are difficult to interpret. Also, it does not appear logical to use indices that are sensitive to the occurrence of weak events (i.e. drizzle) when assessing heavy events (i.e. downpours). Wet-day percentiles suffer from these complications and should thus not be used for the impact-oriented assessment of changes in heavy precipitation events. Nevertheless, there are some appropriate applications of wet-day percentiles, such as studies that require conditional (wet-day/hour) probabilities to investigate precipitation scaling with temperature. However, when extrapolating such scaling considerations to a future climate, changes in precipitation frequency need to be taken into account. All-day percentiles: These indices are computed from all data (wet and dry events) and describe intensity changes at a given absolute frequency (or return period). These percentiles may be viewed as an alternative to more sophisticated statistical approaches (i.e. extreme value theory, EVT) in the case of moderate extremes. Frequency indices: These indices describe the frequency of exceedance with respect to a precipitation threshold (that must be fixed throughout the analysis period or across control and scenario periods). This methodology has been recommended by the WMO. While these indices are often referred to as percentile indices (when the thresholds are defined using percentiles), they do not assess changes in intensity, but rather in frequency. Changes in these indices qualitatively agree with changes in all-day percentiles, but the amplitudes of frequency and intensity changes generally differ. Extreme value theory: Many societally relevant extremes have return periods of at least 10 years. The appropriate treatment of these events requires a more thorough statistical assessment that ideally should include some uncertainty assessment. A number of EVT methodologies (such as block-maxima and peak-over-threshold) are available for this purpose. The estimation of return levels / periods following these methodologies does not depend upon the specification of a minimum precipitation threshold. EVT is used extensively in water-resource engineering, and is well suited when using climate simulations to provide advice about climate change adaptation. Our study also provides equations that can in principle be used to convert between the different percentile indices. However, the conversion involves some approximation and requires knowledge about the precipitation distribution. In practice it will often be easier to redo the analysis for the desired index. In summary, our study shows that significant differences exist between different percentile methodologies. 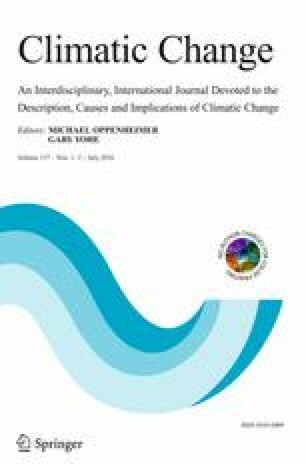 While the overall message of the scientific literature is quite clear and points towards an intensification of heavy events in many regions in response to greenhouse gas forcing, our results show that quantitative information about climate changes critically depend upon careful interpretation of the indices considered. We acknowledge the World Climate Research Programme’s Working Group on Coupled Modeling, and the EU-FP6 project ENSEMBLES, for providing access to the CMIP5 and ENSEMBLES data, respectively. We also acknowledge constructive comments and suggestions from Hayley Fowler (Newcastle University), Reto Knutti and Linda Schlemmer (both ETH Zurich) on earlier versions of this manuscript. The work of Nikolina Ban and Jan Rajczak was supported by the Swiss National Science Foundation (through the PhD grant 200021_132614 and the Sinergia grant CRSII2_136279 “TEMPS”). Elizabeth J. Kendon gratefully acknowledges funding from the Joint DECC/Defra Met Office Hadley Centre Climate Programme (GA01101). Jana Sillmann is supported by the Norwegian Research Council through the NAPEX project (no. 229778). Let us consider an all-day cumulative precipitation distribution P(g) where g is the all-day probability variable (as defined in Fig. 1 and section 2.1). The probability g is taken with respect to all (wet and dry) days. Wet days are defined using a wet-day precipitation threshold (i.e. 1 mm/d), and the frequencies of wet and dry days are denoted with f w and f d , respectively. The cumulative wet-day precipitation distribution P w (g w ) can then be used similarly as P(g), but it expresses the conditional probability relative to wet days. In the following the two functions P w (g w ) and P(g) are used to describe the same precipitation distribution, but using different probability variables. with δf d = − δf w .
This equation relates changes in wet-day percentile intensities with changes in all-day percentile intensities. This shows and quantifies that a decrease (increase) in wet-day frequency mimics an artificial increase (decrease) in δP w , even in cases where the distributions at high percentiles are identical, i.e. δP(g) = 0. Following section 2.3 we next assume that the frequency of exceedance of some fixed precipitation threshold P t is taken as indicator of changes in heavy precipitation. As with many applications of this methodology, we assume that P t is defined as some percentile of the reference period, i.e. P t =P(g t ), where g t denotes the relevant probability level. The situation is sketched in Fig. 1c. Here β’ denotes the scale of the scenario distribution, and δF/F = (F’–F)/F the relative change in the frequency of exceedance. When comparing all-day and wet-day percentiles, one would ideally like to do so at the same absolute probability level g (or at the same return period). Some care is thus needed, as in general g w ≠ g. For instance, Fig. 3a and b compare percentiles at cumulative all-day and wet-day probabilities of g = 97.5 % and g w = 95 %, respectively. The argument behind this rescaling is evident from (A1). This relationship is recommended, unless the precipitation frequency significantly differs from f w = 0.5. In particular, for hourly precipitation events or special climatic conditions, other choices may be optimal.